This substrate produces a brown chromogen precipitant in the presence of peroxidase enzyme. Suitable for brightfield visualization in IHC, ICC, and ISH, as well as various blotting applications. Sufficient to produce 400 ml of working solution. ImmPACT™ substrate has 3 to 5 times more sensitive than the original. Features: - 3 to 5 times more sensitive than the original DAB substrate - Brown chromogen precipitant - Precipitated by Peroxidase - Suitable for aqueous (hardening) and non-aqueous (permanent) mounting - For used on nylon or PVDF membranes but is not recommended for nitrocellulose membranes - Sufficient reagents to produce 400 ml of working solution - For Brightfield, Darkfield, Electron, Spectral Imaging - Greater sensitivity than conventional substrates - Suitable for IHC, ICC, ISH, Blotting Applications, and Elispot - Suitable for use in single or multiple labeling assays - Heat Stable - Consistent and reliable - Stock solutions supplied in convenient dropper bottles promoting ease of handling - Working solution is stable for several days when stored at 4 °C - One year expiry date Applications: - Immunohistochemistry - Immunocytochemistry - In situ hybridization - Blotting Applications - Elispot Details: DAB (3, 3 -diaminobenzidine) HRP substrate produces a dark brown reaction product and can be used for both immunohistochemical and blotting applications. DAB chromogen is effective as a single label or as a second color for multiple antigen labeling. 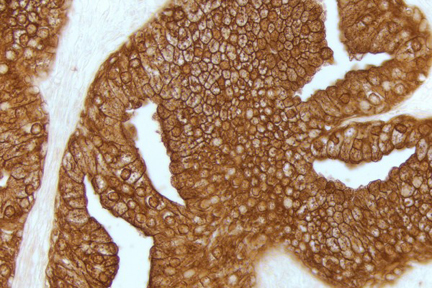 Because of its heat-resistance, DAB can be used in IHC/ ISH double labeling applications. With the aid of imaging systems and software, the spectral profile of DAB can be distinguished from our other proprietary enzyme substrates in applications where antigens are co-localized. Sections stained with DAB can also be viewed by darkfield and electron microscopy. Slides developed with DAB can be dehydrated, cleared, and permanently mounted. The DAB reaction product can be intensified with DAB Enhancing Solution (LS-J1039). This kit contains stock solutions in convenient dropper bottles. 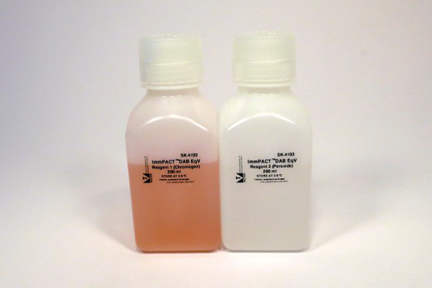 This kit includes nickel, providing the option of changing the reaction product from brown to gray-black and increasing sensitivity in blot applications. Slides developed with DAB/ Ni should be dehydrated, cleared, and permanently mounted. This product can also be used on blots. This kit provides all of the necessary reagents to prepare about 300 ml of working solution. When stored at 4°C, this kit is stable for one year. 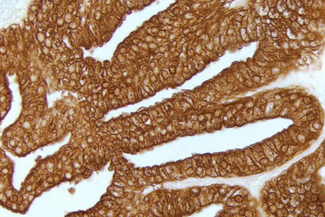 Prostate: Anti-PSA (m), ImmPRESS™ (HRP) Anti-Mouse Ig Kit, ImmPACT™ DAB EqV (brown) substrate.